Melissa Azofeifa, a 26-year-old journalism student at Stony Brook University, was just six years old when her family decided to come to the United States from Costa Rica. Azofeifa is one of nearly 800,000 people who are part of the Deferred Action on Childhood Arrivals program, commonly referred to as DACA. The program allows undocumented immigrants who entered the U.S. before the age of 16 to gain temporary legal status to work and attend college without the fear of deportation. The policy, which was created under the Obama administration in 2012, was repealed by President Donald J. Trump in September of last year. Since then, congressional leaders have tried and failed numerous times to create a legislative solution to protect DACA recipients. Democrats’ most recent attempt to pass a clean DACA bill resulted in a three-day government shutdown. Two weeks later, the fate of the so-called “Dreamers” continues to hang in the balance, with their legal status set to expire in March. “We live here, we work hard, we pay taxes, we give to our communities, we deserve to be here and be citizens,” Azofeifa said. In his Jan. 30 State of the Union address, President Trump called on Republicans and Democrats to come together in support of his new four-pillar immigration plan, which included a path to citizenship for current DACA recipients and other immigrants who came to America illegally as children. “Under our plan, those who meet education and work requirements, and show good moral character, will be able to become full citizens of the United States,” Trump said. The plan also calls for a wall on the southern border, an end to the visa lottery system and an end to chain migration practices, where extended family members or friends of an immigrant follow them to the United States over time. Spouses and minor children are the only family members who would be granted sponsorship under this new law, which concerns Azofeifa. “We do need a full immigration reform like he himself has said but one that includes the families and parents that also sacrificed and have given to this country even without documentation,” Azofeifa said. Azofeifa, like many other DACA recipients, did not have a say in moving to this country and did not know about her status until she was 13 years old. “I wanted to start earning my own money, my parents always taught me to work hard and that if I wanted something bad enough I had to go out and get it so I went to go get my school papers and they asked for my social, and I didn’t have one, that’s the first time I had any idea that something was different,” Azofeifa said. 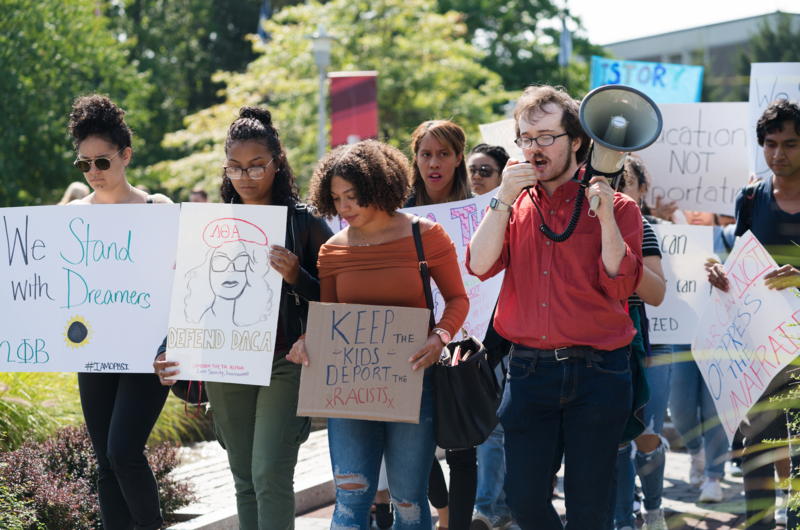 Martin Milon, an undeclared sophomore and vice president of the Long Island Immigrant Students Advocates (LIISA) chapter in Stony Brook, echoed Azofeifa’s sentiments. LIISA and the Stony Brook College Democrats held a phone bank Wednesday to contact their local representatives and voice support for Dreamers. During the event, participants called Sen. Charles Schumer, Sen. Kirsten Gillibrand and Congressman Lee Zeldin. Brianna Rodriguez, a senior women’s, gender, and sexuality studies major and the president of the Stony Brook chapter of LIISA, hopes the phone bank will lead to action. “The goal is to fill up our members of Congress’ voicemails, to let them know that we want them to pass [the] Dream Act,” Rodriguez said. The Dream Act would ensure that DACA recipients have a legal way to citizenship. Although this issue is important to LIISA, Milon believes DACA isn’t as talked about on campus as it should be. Evelyn Lopez Rodriguez, a freshman political science major and secretary of LIISA, is a U.S. citizen, but her sister is a DACA recipient. She herself feels the stress and worry mentioned by Milon. Rodriguez, whose parents are also undocumented, spoke about the concern she has for their future. Thomas Sheroff, a senior philosophy and psychology major and founder and secretary of the Young Democrat Socialists of America club, attends every LIISA event because the topic of immigration is essential to socialism and socialist values. “Immigration labor is so essential to processes made in the U.S. but it’s not recognized,” Sheroff said. Sheroff believes that DACA and other immigration issues are not only important economically but morally as well. After Congress agreed to end the three-day shutdown, many DACA recipients and advocates said they were unhappy. Despite the challenges faced from being in this country illegally, Azofeifa said she is ultimately happy she was able to come here.